PhilStockWorld.com | Technical Tuesday – Are We Moving Up to a New Range? Technical Tuesday – Are We Moving Up to a New Range? 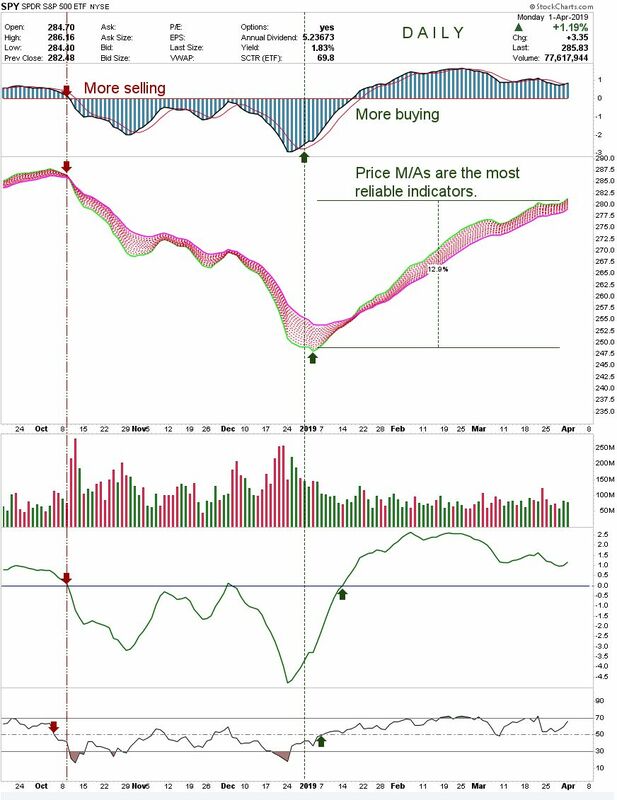 2,873, in fact, as of yesterday's close and I really liked this chart by Andrew Lais at Stockcharts on the SPY showing the huge turnaround in buying activity that has fueled what is now a 12.9% rally off the January lows. Clearly, sentiment could not be better and that may be the problem as we head into an earnings season that is almost certain to disappoint the bulls. On the other hand, if they are willing to consider Q1 a bump in the road, we may truly be off to the races if 2,850 firms up as a new bottom for the senior index. We have a light round of earnings this week but, just this morning, Walgreens (WBA) gave a disappointing report and promptly dropped 8% pre-market after reporting earnings of $1.64 vs $1.72 that was expected and also cutting guidance for 2019 to flat to last year's $6/share in earnings, which makes $60 quite a bargain to me (we're long) and our 2021 target was only $62.50 anyway – so we don't mind a little pullback. In a trend that will challenge the sector, declining reimbursements for prescription drugs cut into the company's profit margins. While Walgreens is filling more prescriptions at the pharmacy counter, it’s making less money on them – a worrisome sign for a key part of the business. Prescription sales in its U.S. stores rose 9.8 percent in the second quarter, but gross profit at the pharmacies fell 3.2%. “The market challenges and macro trends we have been discussing for some time accelerated, resulting in the most difficult quarter we have had since the formation of Walgreens Boots Alliance,” Chief Executive Officer Stefano Pessina said in a statement about the quarter. While those problems may be unique to WAG, poor Q1 earnings will not be unique at all and, if investors are going to chop 8% off the price of a company for matching last year's earnings – then don't expect 2,850 to hold up on the S&P 500 as more and more earnings reports are revealed. http://welcome.philstockworld.com/wp-content/uploads/2015/09/PSW-Adooma-logo.png 0 0 Phil http://welcome.philstockworld.com/wp-content/uploads/2015/09/PSW-Adooma-logo.png Phil2019-04-02 12:30:472019-04-02 12:30:47Technical Tuesday – Are We Moving Up to a New Range? Manufactured Monday – Chinese Data Turns Back Up, Markets Rise With It Why Worry Wednesday?